SEP IRA, Roth IRA, Traditional IRA, all of these terms are enough to make one’s head spin but all they are, are tools to help you secure your financial future for your family and for yourself. Finding the right person to organize, explain and develop a plan for your retirement is essential to meeting your goals and dreams. Let us make sure you’re on the path to success. We’ll even take a free look at your current plan and discuss how we can help you better reach your goals. Tax management can be a burdensome stone to wealth building and maintenance but it doesn’t have to be viewed that way. Having and knowing the right people can help you look at taxes from a different perspective. There are a number of advantages and disadvantages that having and building wealth can create in regards to taxes. Let us help you navigate through each one. Building and maintaining wealth doesn’t end with you. Planning and organizing your estate is essential to the longevity of your wealth while enjoying your family and for generations to come. If you don’t have an estate plan, the courts may be given more power than necessary to decide your affairs. 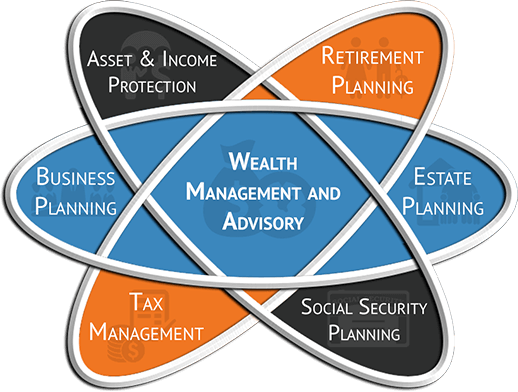 Let our experts help with your estate planning. Social Security has become an even more important topic of discussion in the role it plays for your retirement. Even if distributions are not needed, there are still many factors that come into play in the organization of your social security benefits. With estimates in place and forecasts in anticipation of the future, we work closely with our clients to develop extensive plans on how social security can fit into your changing lifestyle. Asset and Income Protection is a vital part of every financial plan. We understand that making sure your family is protected if something happens to you; whether you pass away prematurely or are fighting through a long term sickness or injury you still have many financial obligations and people relying on you. Protecting your family, your income, and your life is one of the greatest acts of kindness you can do for yourself and your loved ones. We will evaluate YOUR needs and help you determine the proper amount of coverage for any insurance planning. Running a business can be burdensome but with help you can make sure you have all of the tools to keep employees happy and financials strong. Need a benefit package? From a solid 401k plan to group life insurance policies, we can make sure you have a great set of benefits to keep great employees happy. We also have a talented team of referrals for other business needs like tax management.